LANDOVER, Md. — The Packers were in possession of the ball and a 24-18 lead heading into the fourth quarter of Sunday’s wild-card playoff game at FedEx Field. The Redskins drove quickly down the field on the opening possession of the second half. On fourth-and-1, Kirk Cousins threw to Jordan Reed for 17 yards to the Packers 7-yard line. Eventually, the Redskins would face third-and-goal from the 3. Out of a five-wide formation Cousins ran a quarterback draw for a touchdown that gave the Redskins an 18-17 lead with 9:41 to play in the third quarter. It was announced Quentin Rollins had sustained a quad injury. His return was questionable. Davante Adams sustained a knee injury in the third quarter and his return was questionable. The Packers followed with a drive that crossed midfield with seven minutes to play in the quarter. 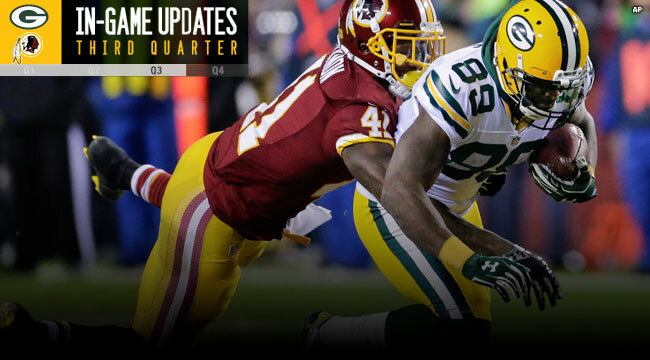 The Packers faced a fourth-and-1 at the Redskins 45. Eddie Lacy gained 11 off left tackle. Lacy then followed with the Packers’ longest run of the game, 30 yards to the Redskins 4. On the next play, James Starks circled right end for a go-ahead touchdown, 24-18, with 4:12 to play in the third quarter. Green Bay’s defense forced a three-and-out and the Packers had the ball and the lead with 3:02 to play in the quarter. The third quarter ended with the Packers at midfield.